During the latter part of 2017 the Cornwall Museums Partnership [CMP] launched The Heritage Awards, an opportunity to celebrate museums within local communities across Cornwall and the Isles of Scilly. In addition The Children's Trail Project has been shortlisted in the Friendly Family category. Currently the Museum are submitting further information prior to the next and final judging process which will be commencing on 5 February 2018. The winners will be announced during an Awards ceremony in Redruth, on the 20th of March. Chair of the Lostwithiel Museum Association, Christine Walton said “ Being shortlisted is a brilliant start to 2018. To win would be the 'icing on the cake'......of course!" 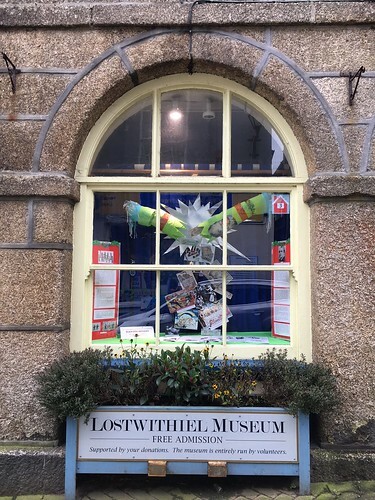 More information about Lostwithiel Museum available on their website. In particular rules for the Photographic competition available on this page. An introduction to the Children's Trail can be accessed here. To date there have been two sponsored Window Displays. The Advent window, featuring history of the Christmas Cracker, was sponsored by Black Dog Antiques and the current display, leading up to Valentine’s Day, has been sponsored by Asquiths Restaurant.